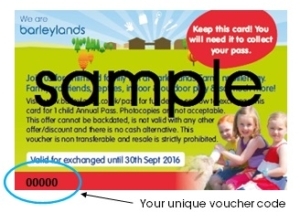 If you have received a Free Child Annual Pass Voucher following your child’s visit to Barleylands as part of a School Trip you can order your free child pass here! An Annual Pass is worth £57 and you will be able to enter your voucher code (bottom left on your voucher) on the following pages to reduce this to £0. Please follow the on-screen instructions to set up your new pass/es on our ticketing page here.